While the characters in James Wesley Rawles’ novel Patriots are fictional, the world in which they inhabit and the survival techniques that they use are all authentic. 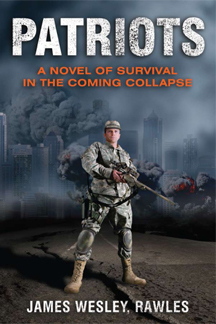 The full subtitle of the book, Surviving the Coming Collapse: A Novel of the Turbulent Near Future gives you the idea that Rawles is convinced that while his is a work of fiction at the moment, we’re not far away from needing to learn these skills ourselves. You can read it in part just for fun or as a textbook in how to survive in a post-apocalyptic world. The key character in the story is an unassuming accountant named Todd Grey. The whole novel is written from his viewpoint so you get a real feel as to what the apocalypse might look like for you. Unlike other post apocalyptic novels, it has no big war or nuclear attack to start it. Instead, Todd tells the reader about a global financial crisis that leads to hyperinflation and the collapse of all the major stock markets. As an accountant, Todd can see the foolishness of the markets and how the whole financial sector sits precariously on a foundation of promises and optimism. This melt down in society leads to full scale rioting with people attacking each other to try to survive. Faced with these foes, Todd and his wife Mary move to a survivalist colony out in the mountains in Idaho. They live with other like-minded people and successfully outwit looters and cannibals driven to human flesh by the lack of readily available food. They use modern survival techniques to live off the land and defend themselves. The book then skips a year into the future and explores what would happen to a centralized government in such a situation. Rawles plays out that the government collapses and requires help from the UN to restore sanity and control over the country. However, the neat twist at the end is the government forces are not all that the survivalists hope they would be. Feeding yourselves – The biggest challenge anyone will face in a TEOTWAWKI event is food. Meat may be hard to find and having enough water for garden lots will be difficult. The novel gives detail for homemade irrigation systems and crop rotation techniques to make best use of your local soil. Self-defense – The group wants to protect what belongs to them and in the survival situation pictured by Rawles, plenty of people have not made appropriate provisions and so they are ready to use force to get what they want. The book outlines different traps, snares and early warning systems that you can make using naturally occurring materials. Field dressing – In a survival situation, every wound and infection is life threatening as access to a hospital or modern medicine is no longer available. Fortunately, Mary Gray is a nurse and is able to talk about making bandages from reeds and leaves and the use of different plants for medicinal purposes. It is important to realize that James Rawles is constantly updating Patriots with new information based on current technology and survival ideas. He has had a keen interest in survival techniques since his time with the Scouts as a child and has many years of Army experience, which has given him the specific knowledge of how the government would respond to this sort of large scale rioting. The book may not be the only reference you will need for survival, but it gives a good starting point and an interesting view as to what kind of world in which you will be living.